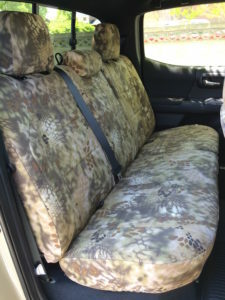 I purchased my seat covers 2 years ago and recently traded the vehicle in when I took the seat covers off, the seats were still in immaculate condition, even after working out at the gilsonite mine and having Muddy wet dogs on them. These are excellent seat covers, and the staff are professional and friendly. I highly recommend Covers & Camo to all who are looking to protect the upholstery of their vehicle. Ordered the front seats in Kryptek Typhon for my Jeep Patriot at Cowboy Christmas in Vegas last year. I went with the tactical package and extra driver’s seat pistol pocket since I hunt, shoot and have my CCW. They are not cheap, but nothing of any value ever is! The service at the show was fantastic, they delivered them early, they were easy to install (super snug fitting) and they have worn like iron so far. I’ve gotten a ton of compliments on them and will be getting the back seats done this summer. High quality craftsmanship – can’t be compared to the other seat covers I’ve had in the past. And they look really badass. Bought front and rear covers for my 2016 Tacoma. They exceeded my expectations! They look awesome and fit like a glove! George was very helpful and knew his product. Very very pleased and worth every penny. I surprised my hubby with camo covers and he loves them. They look awesome and the fit couldn’t be more perfect. We’ve bought covers in the past from other companies and were always disappointed for one reason or another, but Covers & Camo rocked my order and I scored major points with hubby. Thanks guys!! Copyright © 2018 Covers and Camo. All rights reserved.